Amendments to GO.Ms.No.91, Dated:11-12-2017:: GOVERNMENT OF ANDHRA PRADESH :: School Education - Guidelines for conducting Andhra Pradesh State Teacher Eligibility Test (AP-TET) under the Right of Children to Free and Compulsory Education Act (RTE), 2009 - Amendments - Orders - Issued. 3. From the Commissioner of School Education, Andhra Pradesh, letter Rc. No. 200/TRC¬1/2017, dated 8/1/2018. Existing Para:: There will be Two Papers for the TET Paper-I will be for a person who intends to be a teacher for Classes I to V, Paper-II will be for a person who intends to be a teacher for Classes VI to VIII. A person who intends to be a Teacher either for Classes I to V or for Classes VI to VIII shall have to appear in both Papers (Paper I and Paper II). Note (6): For Paper III, the syllabi for TET of Concerned Language Teachers and are Special based on topics of Classes VI to VIII. The difficulty standard of questions as well as their linkages could be up to Senior Secondary Level (12 th Class). The SCERT will be providing the syllabi for Language Teachers. 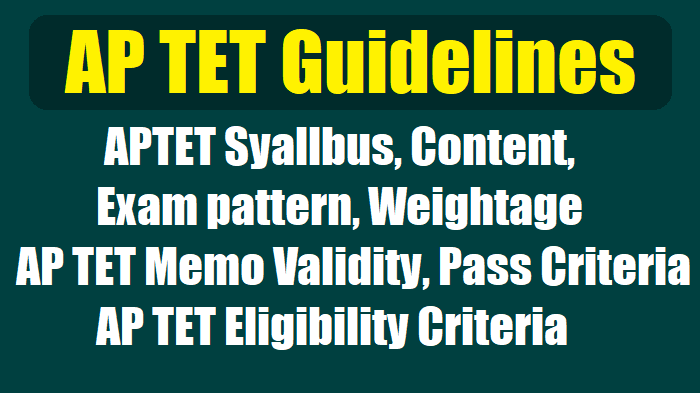 Amendments to GO.Ms.No.91, Dated:11-12-2017 GOVERNMENT OFANDHRA PRADESH - School Education - Guidelines for conducting Andhra Pradesh State Teacher Eligibility Test (AP-TET) under the Right of Children to Free and Compulsory Education Act (RTE), 2009 - Amendments - Orders - Issued. 2. From the Commissioner of School Education, Andhra Pradesh, letter Rc. No. 200/TRC¬1/2017, dated 12/12/2017. In the circumstances stated by the Commissioner of School Education, AP, in the letter 2nd read above, and after careful examination of the matter, Government hereby issue the following amendments to the aforesaid guidelines issued in G.O. Ms. No. 91, School Education (Exams) Department, Dated 11/12/2017. the words "5000 candidates" shall be substituted with the words "300-500 candidates"